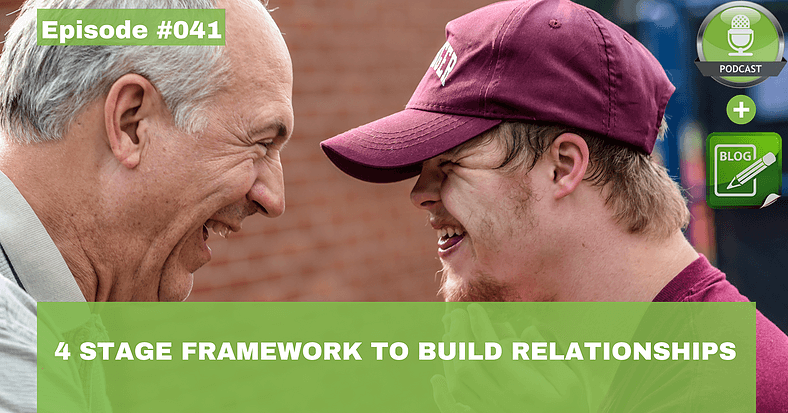 On this week’s podcast/ blog, Al Condeluci, CEO of CLASS, provides us with a 4-stage framework to build social capital (meaningful relationships) for people with disabilities. Keenan Wellar also joins us to share the experience of putting the framework into action with his team at LiveWorkPlay. This podcast was created from a segment in Episode 006, so it might be the second listen for you long time listeners, but it is so good that it is worth another listen! “Close relationships, more than money or fame, are what keep people happy throughout their lives, the study revealed. Those ties protect people from life’s discontents, help to delay mental and physical decline, and are better predictors of long and happy lives than social class, IQ, or even genes. That finding proved true across the board among both the Harvard men and the inner-city participants.” Link to article. In conversation with Al Condeluci, he explained to me that the average person maintains approximately 150 social connections [The Rule of 150] , however the research is starting to show that people with disabilities only maintain on average 25 connections. More to come on this in future episodes! The approach that Al Condeluci shares is a 180-degree approach from looking at a person’s deficits. “Oh, Sarah can’t do that…. She would never be able to (fill in the blank).” Al’s 4 – stage approach zooms out and looks at the much bigger view (macro view as Al calls it) of a person’s life. Keenan Wellar, Co-Leader of LiveWorkPlay, leads the organization to implement Al’s 4-stage framework for their clients. Keenan shares that taking this approach is a lot of hard work, and takes some figuring out. They don’t always get it right the first time. Keenan shares the story of Chris, a young man with an intellectual disability, who is a soccer player and his current team wasn’t working out. The LiveWorkPlay team worked with Chris to find him a new team that would be inclusive and accepting of what Chris brought to the team. They met with Chris’s new team to educate them on being inclusive, however, the team said this is who we are – we are accepting of everyone. Chris went to his soccer game, and it was overlooked that he didn’t have a ride home. The next morning the LiveWorkPlay team was in a panic to learn that Chris was invited to go out for beers with the team after the game, and someone drove Chris home. Chris didn’t get invited out for beers and driven home because he had a disability, it was because he is a part of the team. A huge thank you goes out to Al & Keenan for the work that they do to improve social capital for people with disabilities!